"Choosing between one's faith and serving one's country is a decision that no one should have to make." 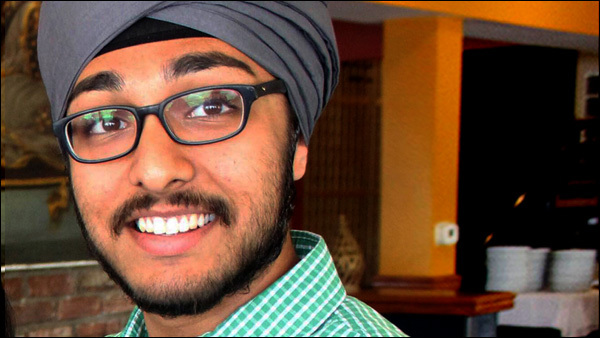 A Sikh student at Hofstra University has filed a lawsuit against the United States Army, claiming that he was refused a religious accommodation that would allow him to enlist in his school's ROTC program in accordance with his faith -- without shaving his beard, cutting his hair and removing his turban. As a practicing Sikh, Iknoor Singh keeps his hair long and wears a turban. However, he was told by ROTC recruiters that he would not be able enlist unless he complied with all Army grooming and uniform rules, which would require him to immediately cut his hair, shave off his bear and remove his turban. Singh, learning that the Army had previously granted religious accommodations to several Sikhs and soldiers of other faiths, applied for an exemption but was denied. The lawsuit, filed jointly by the ACLU and United Sikhs, says the Army's policy is a violation of Singh's religious freedom. When Iknoor Singh requested a religious exemption from the military's grooming policies to enlist as an ROTC cadet in April 2013, his request was first denied on the grounds that his noncompliance would have "an adverse impact on the Army's readiness, unit cohesion, standards, health, safety, or discipline," court documents said. The Army subsequently adjusted its decision, saying Singh could only seek an exemption after he was enlisted as a cadet -- creating a catch-22 in which Singh would have to violate his faith to be able to apply for a religious accommodation, the documents said. "I couldn't believe the military was asking me to make the impossible decision of choosing between the country I love and my faith," Singh said in a blog post on the ACLU's website. The lawsuit, filed jointly by the ACLU and United Sikhs, which describes itself as a U.N.-affiliated nonprofit organization, claims that the Army's denial of religious exemption violated the Religious Freedom Restoration Act. The case was filed in the U.S. District Court for the District of Columbia. In this blog post on the ACLU website, Singh argues that religious beliefs and practices that don't pose risk or harm, as in the case of his own Sikh faith, shouldn't prevent anyone from entering military service.